If you want to get started quickly, with the best results for minimum fuss, please see my Raspberry Pi NTP quick-starter page. Please also see that page for issues with the Jessie release of Linux, and with the newer Raspberry Pi model 3. I start by describing how to get the Raspberry Pi running with just a LAN connection - no display, keyboard or mouse - a so-called headless operation. I then describe how to configure NTP for your environment, and adding a GPS/PPS receiver to convert your box into a stratum-1 NTP server including the operating system updates needed. Next, I note a couple of problems I had with the first GPS receiver I tried, and how I cured those with a different GPS receiver to produce a stratum-1 NTP server consuming about 4 watts. The easiest approach with good performance is described here. Since starting this page there have been two developments which make the process somewhat easier - a program has been developed which allows the use of an unmodified operating system by working in user-mode rather than kernel-mode PPS, and a module is now available which plugs directly onto the 26-pin GPIO header of the Raspberry Pi, so no soldering is involved. My thanks to Folkert van Heusden and Anthony Stirk for these developments. Note that the Adafruit GPS Hat uses GPIO 4, physical pin 7, so you would need to change the commands given in this document. Later additions have included remote monitoring of the NTP server performance, and more general monitoring of the Raspberry Pi using the standard SNMP functions, with an additional CPU temperature monitoring add-on. My main Raspberry Pi page may also be of interest. Note that good performance is dependant on the GPS unit having a clear view of the sky, particularly the southern part of the sky if you are in the northern hemisphere. With older GPS receivers this required an outdoor antenna, but more modern units such as those mentioned here may well work indoors providing that some sky is visible, perhaps on the top floor of the building (as I am). If you have an "RF-proof" roof (lead-lined, perhaps?!) or certain windows with a lining to stop incoming heat, or wall construction including metal, you may still need an outdoor antenna, and almost certainly if you live in a basement! Whilst weather will normally have only a small effect in the signal - e.g. heavy rain - it's possible that a layer of snow could attenuate the signal enough to stop the GPS receiving enough signal. Monitoring performance may help you spot these problems. (Thanks to Joe, HB9DRT for the information on snow - I've only seen that problem once here during an exceptionally cold winter). 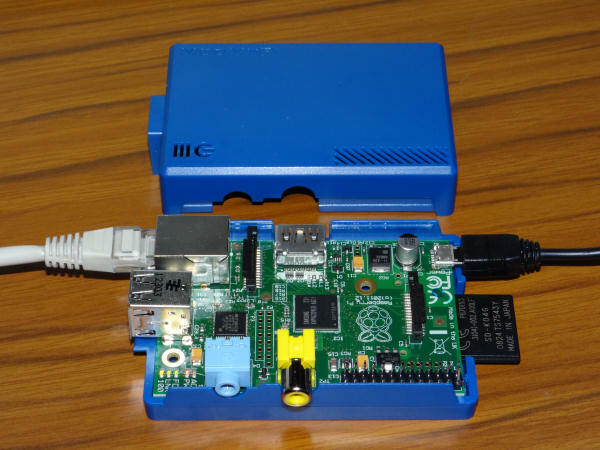 The Raspberry Pi is a credit-card size computer, available from distributors across the world. 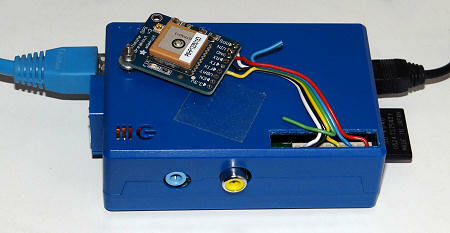 I bought an attractive blue case and 5 V, 2 A power-supply from ModMyPi. You can see the Ethernet lead on the left, and the 4 GB SD card with the operating system on the right, together with the micro-USB power lead. There is a model-B (shown and used below), and a lower-spec model-A which may become available at some time in the future. I'm using the 512 MB model-B, introduced in Autumn 2012. Shown below are the offset results with the Raspberry Pi in three configurations: with WAN-only connections syncing to the Internet (as you might find it a typical home situation), with LAN connections to a local stratum-1 server, and acting as a stratum-1 server itself with two different small GPS/PPS receivers as the reference clock. Any glitches in the live data are likely to be the result of me rebooting, making configuration changes, or the GPS signal being less than normal. The normal NTP configuration is listed here. As expected, syncing from the LAN produces better results than from the Internet (WAN), and making the device into a stratum-1 server results in even lower offsets. Zero offset corresponds to the middle line of the graph, as the utility I use is incapable of plotting negative values. I therefore add half the Y-axis range to the actual values before plotting. Note: these graphs are not all to the same vertical scale! The resulting performance is good, but it will depend on both the loading of the link between me and the ISP, and the general load on the ISP's network and the general Internet. Offsets are reported to be with about +/-5 milliseconds (and therefore off-scale once on the graph below). The four-line ntp.conf in use at the time is shown below the graph. Changing to a tight coupling to a local stratum-1 server on the LAN produces much better results, with timekeeping in the order of 30 microseconds. I've added a second graph with a +/- 500 microsecond scale to show any larger excursions. 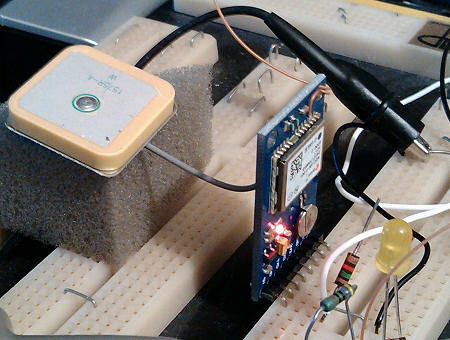 Much better results are obtained using a Trimble Resolution SMT GPS module, with its PPS pin connected to the GPIO 24 pin for a kernel-mode "ATOM" ref-clock. 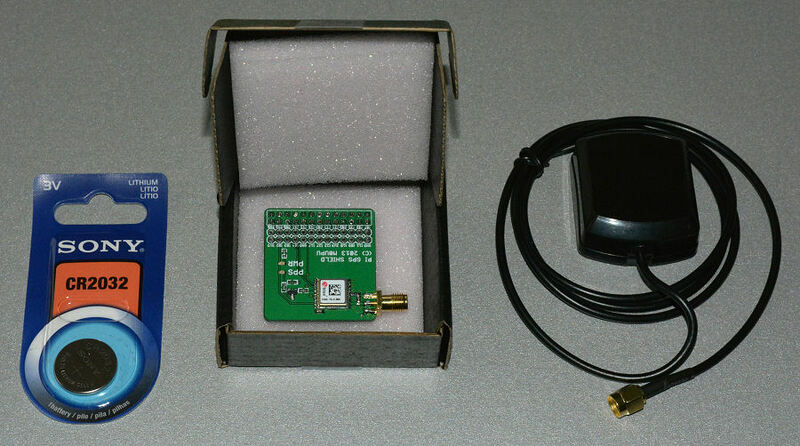 This unit is a "timing" GPS, with 15 ns specified accuracy for the PPS signal. Each second pulse on the GPIO pin causes an interrupt in which the CPU clock is noted, and then used by NTP to make fine adjustments to the software clock speed. The transients of a few microseconds amplitude lasting for about an hour may be due to sudden ambient temperature changes affecting the crystal used by the card's clock generator. Not shown on the graph, but the offset due to a CPU-heavy task (recompiling NTP from source, taking about 25 minutes) resulted in a 20 �s positive excursion, followed by a 10 �s negative excursion as temperatures cooled and NTP recovered. When using a u-blox MEO-6M GPS module, with its PPS pin connected to the GPIO 24 pin for a kernel-mode "ATOM" ref-clock, similar results are obtained. The transient in the middle of the graph is when a second device was connected to the 5 V line from the USB. This unit is a "navigation" GPS, where the PPS is specified about 100 ns, rather than a "timing" GPS - but the difference between the two units is most-often masked by the other variations in the system. Later, it was noticed that the offset was varying periodically, and this is an unexpected result. Below is a sample from 2012 Dec 19-21, with the less stable period staring at the end of 2012-Dec-19 and finishing at the end of Dec 20. More detailed examination of the loopstats data shows an actual period of just over 100 seconds, and it's being aliased by the 5-minute sampling of MRTG. To test, I had changed the GPS receiver from U-blox 6M to Adafruit MTK3339 navigation GPS module, and later changed again from the navigation module to a timing GPS module based on the U-blox LEA-6T, to see whether the oscillation was affected. These changes made no difference to either the magnitude and the period of the oscillation, and the amplitude of the oscillation was considerably greater than what would be expected even from a "navigation" GPS receiver. So my earlier theories about navigation versus timing GPS modules, USB loading, and serial I/O loading were incorrect. This problem was eventually cured by a firmware update on Raspberry Pi #1, from version 337601 to version 346337. I added a second Raspberry Pi computer and now have both connected to the two different GPS/PPS receivers mentioned above, but with the antennas for those receivers in a similar indoor location. Below is a comparison of the performance. Raspberry Pi #1 is located in an unheated room with a north-facing wall. Raspberry Pi #3 is also in the office, but situated a little nearer to a radiator, providing the daily transients. In mid-November 2013 I moved to a new kernel which was locally compiled with an option to improve NTP performance. and here's a slightly different way of looking at the value of the offset, plotting the absolute value of the offset, red for positive offsets and blue for negative offsets. Transient events such as restarts have been removed. Many folk have asked about adding a GPS to the Raspberry Pi without needing soldering, and now that has become a reality thanks to the NTPI GPS Addon Board produced by Nevis Computers Ltd in the UK. I used the rpi_gpio_ntp program was developed by Folkert van Heusden and announced in the Time-Nuts mailing list, which allows user-mode working with the PPS signal, thus not requiring a special version of the operating system. Current versions of Raspbian no longer need this. A card with the timing quality GPS device and SMA connector which plugs into the 26-pin GPIO connector on the Pi. An optional magnetic puck GPS antenna, or you can use your own antenna with an SMA connector. You may also need: A CR2032 battery for backup, which fits on to the underside of the card. To get this working with a Raspberry Pi, these are the steps I took. I've included the steps to add MRTG monitoring and remote file access from Windows systems, but you may omit those if you don't need them. Altered the name of the device - how to. Configured NTP to use the pool directive, allow remote monitoring, and log statistics. Updated NTP to the current development version (I used an FTP copy from another Pi). Setup serial I/O on the Raspberry Pi. Installed and configured gpsd and its utilities. Configured NTP to use the shared memory for coarse time (driver type 28.0). Installed the rpi_gpio_ntp program from Folkert van Heusden (only for very early Raspbian versions). Configured NTP to use the shared memory for PPS (driver type 28.1). Installed SNMP and configured various MRTG data collectors (optional). Configured SNMP to monitor the CPU temperature (optional). Installed SAMBA, so that I could access the NTP statistics from the PC (optional). Set the PC for wireless networking Wi-Fi USB dongle (optional). How well does this user-mode work, you may ask. Well it's pretty good, although not quite as good as kernel-mode, but more than adequate for the precision offered by the Raspberry Pi. Perhaps the best that the Pi could do otherwise would be syncing over a LAN connection to a stratum-1 NTP server. The offset plot comparison below shows the Pi synced to a stratum-1 server but over Wi-Fi, and then the performance after installing the NTPI GPS Addon board. An ideal plot would be a straight line at the 500 microsecond level on this graph (I have to add an offset as MRTG can't plot negative numbers). The 6-hour averaged jitter reported by NTP dropped from 100-150 microseconds to under 4 microseconds. The improvement in going from Wi-Fi sync to PPS sync is obvious! Thanks to e-mails from Olav Andrarde and Timo Kokkonen I have discovered that PPS support has now been added to the Linux available for the Raspberry Pi, although you do need to add a couple of lines to the configuration to enable it. As Raspbian in continually evolving, the exact method for making these changes also evolves, so depending on when you downloaded Raspbian you should follow either the November 2014 or the February 2015 sections below. I've put the more recent information first, although I normally prefer things to be listed in chronological order like in a diary! $ sudo nano /boot/config.txt - Add dtoverlay=pps-gpio,gpiopin=18 on a new line. If you previously added bcm2708.pps_gpio_pin=18 to the end of cmdline.txt, remove it. $ sudo nano /etc/modules � Add pps-gpio on a new line. Now proceed to check that PPS is working. It must be on the same line, not on a new line, as Ray Hunter found out! Next, you need to tell the kernel to load the module which provides this support. Quite why this can't be automatic I don't know! Add the module name to the end of the file /etc/modules. at the end if the list, and reboot. $ sudo ppstest /dev/pps0 # press Ctrl-C to cancel.. Note that there is no value given for the "clear" time. Gary E Miller reports that the pps-gpio driver only looks for one edge, the positive going edge. If you are using a different GPS device from those mentioned here you may need to a 3.3 volt output inverter in the PPS line from the GPS. Altered the IP address for the Ethernet port to a fixed (static) address - how to. Note: if you do this, you may need to edit the hosts file on your systems to allow access to the device by name rather than by IP address. 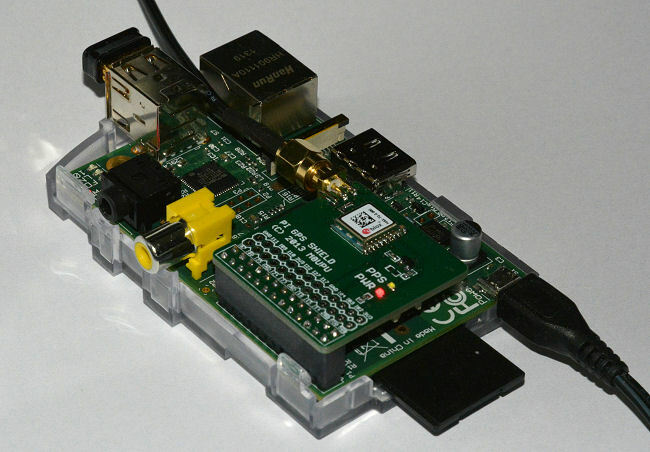 Add a line such as: 192.168.0.51 raspberry-pi-1 to the file (with the address and name of your RPi, of course). On Windows-8, note that Windows Defender may try and replace an edited hosts file with the default one, thus removing your changes! On Windows, the file to be edited is \Windows\system32\drivers\etc\hosts, and you may need Administrator level access to edit that file. Installed SNMP and configured various MRTG data collectors. Installed SAMBA, so that I could access the NTP statistics from the PC. Set the PC for wireless networking with an old NetGear Wi-Fi USB dongle (later replaced with an Edimax unit). Quite a few of the "standard" Raspberry Pi utilities are not present in this OS image, and will need to be downloaded separately with apt-get. Here's what it looks like at the moment. The patch antenna is attached to the white ModMyPi case with double-sided sticky tape, and the receiver board with a single nut and bolt. The leads were also from ModMyPi, and the 150 mm length is not required here! The Wi-Fi dongle is on the left. Performance graphs are here. You need a terminal program which will work in SSH mode - I used PuTTY on a Windows XP PC. Your path and saved settings name will be different. By the way, by adding an X-windows server program such as Xming to your PC you can see the graphics from the Raspberry Pi as well, should you wish, but that's not required for the operations described here - you can do everything directly from the command-line. I followed the advice here to update the OS, although I don't think that it was really necessary as the OS downloaded was only a month old. To run the commands requires privileged access, achieved here by prefixing the command with sudo. These commands take considerable time to run, and require Internet access from your Pi. Allow 30 - 45 minutes. and redirect the output to a text file. Thanks to Graham in County Durham, UK, for that tip. and select the appropriate region and town. For the UK, I selected Europe/London. The procedure will reflect the timezone data and current date and time in both the local time and UTC when it completes. Although there is a graphical interface with which to configure the Wi-Fi, it didn't seem to work for me. In any case, if you are operating headless, you may not even have access to the GUI. The network adapter I used was the tiny Edimax EW-7811UN 150Mbps Wireless Nano USB Adapter unit, which I got from Amazon (fair price and good delivery). You will get a hex result such as "b7d90db3ddbd11d5ddb3dbfd81de" which you will need later. Note that the ssid must be inside quotation marks. You can then use the $ sudo ifdown wlan0 and $ sudo ifup wlan0 commands to restart the wireless networking. I would also advise a reboot to ensure that everything has gone as expected. The NTP configuration file lives in the /etc directory, so you can change to that directory to edit the file. Because the file is a system file, you need to sudo command to allow to save the edited version of the file, but first, I made a copy (cp) of the supplied file just in case I messed up and had to revert to the working NTP configuration. I used the vi editor which is supplied with the OS, and there are instructions for vi here, and also at Guru99.com as part of a Linux/Unix tutorial for beginners. The nano editor which I discovered later, and which is supplied with the Raspberry Pi, is a much better choice - much easier to use! If you were concerned about security on your LAN you might wish to be more selective in making changes to the restrictions. One approach towards getting NTP to see the serial part of the GPS receiver output stream (for the coarse part of the time, the seconds) is to install the gpsd driver, and this does allow some checking of the basic connectivity. 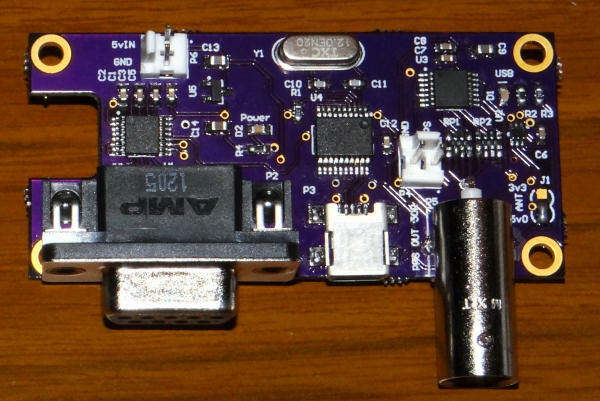 The GPS I started using was a Trimble Resolution SMT, for which I managed to get both an evaluation board and an interface board which converted the serial output into both RS-232 and USB. I used the serial over USB rather than the RS-232 for the Raspberry Pi. This is the GPS I used. It is an evaluation board for a timing GPS surface-mount receiver, the Trimble Resolution SMT. This is slightly unusual in having a TSIP-format output rather than the standard NMEA format, but the Linux gpsd can recognise and accept that format. The output is on an 8-pin header with a non-standard pin spacing! It's sensitive enough that I could use a magnetic mount GPS puck in my upper floor computer room. Just as I acquired the board, there was an offer on the time-nuts mailing list for a ready-made interface. This has a matching 8-pin connector, and provides a PPS output, serial output at RS-232 levels (not used here), and has a built-in serial to USB converter! Ideal! Do be careful in using other GPS units that you don't exceed +3.3 V on the PPS signal fed to the Raspberry Pi, as a 5 V signal level will damage the device. I used a resistive divider (not shown) to reduce the level to a nominal 3.2 V.
I soldered a 3k9 * + 6k8 resistive divider to the PPS header, and then soldered a twin lead fed to a 0.1-inch header I happened to have lying around. This I connected to pins GND and GPIO-24 on the 26-pin Raspberry Pi GPIO header. * - incorrectly given as 1k0 earlier. First, I connected the device to the lower USB port, and then checked what was seen on the USB ports. Bus 001 Device 005: ID 04d8:00df Microchip Technology, Inc.
and in my case about the time I plugged in the device there was a reference to: ttyACM0:, and I recognised tty as a serial port (TeleType from long ago!). If you are using a real serial device it will appear as ttyAMA0. which may upgrade the entire OS to the current version. At this point, you should be able to see a text-mode output from your GPS receiver by running the command "cgps -s", something like the following. Note that as this is a timing-mode GPS, it will prefer satellites which have a higher elevation, as these are less likely to have multi-path effects or reflections. However, for the level of accuracy for which we are aiming (microseconds, not nanoseconds), this refinement is not essential, and I could see no significant difference between a "timing" GPS and a "position" GPS on the microsecond level. Note that you will need to make gpsd start automatically at boot time, and to tell the configuration tool what device to use, and add the "-n" option for working with NTP. See the note later in this document. Now that gpsd is working, we can edit the NTP configuration to add a type 28 reference clock which will make NTP look at the shared memory created by gpsd. This can be done for both the coarse time (seconds) and the fine time (PPS edge) with a 28.0 and a 28.1 driver, although I only use the 28.0 driver here as the Raspberry Pi supports PPS via a kernel-mode driver (more later). The first step is to get the seconds alone, and be aware that this will not be better than Internet time alone due to the offset of the serial/USB data from the true second, and because of the variability and drift in this offset. We will need to add a connection later between the PPS signal and one of the Raspberry Pi's I/O pins to generate a PPS interrupt. Here is my modified ntp.conf file. I've used 0.000 for the time1 modifier to start with, so that we can determine an approximate value for the delay of the serial data from the GPS after ntp is up and running. I changed the refid for the type 28 driver to "SHM" to indicate more clearly that the data is coming from the SHared Memory provided by gpsd. Note that I have marked more than one server as "prefer". This is because if the first preferred server goes offline, it appears that NTP will no longer accept the PPS data as valid (is that wise? ), so a second preferred server is configured to cover that possibility. In my case, it happens because 192.168.0.3 sometimes has an NTP update, causing its NTP to go offline for some seconds, and hence causes a glitch in the connected servers. Having more than one preferred server should prevent that. and while the SHM driver is present and connected (reach = 377), it has been rejected by NTP (the "x" in the first column), perhaps because its offset was consistently too great compared to the other servers. That's the purpose of the time1 modifier in the "fudge" command. We can see that the SHM output is some 350 milliseconds later, so we can use that value for time1 to bring the GPS output approximately into line with UTC, as shown in the edited /etc/ntp.conf below. (The time values in the ntpq -p display are all in milliseconds). Hint: if at this point the reach field for the SHM device stays at zero, likely the gpsd wasn't started with the "-n" option. You can make the gpsd always start at system boot time with that -n option as described later in this note. The output from ntpq -p then shows the offset for the SHM driver to be much nearer to zero, and this /might/ be good enough for you if you are out in the field with no other reference. But we can do better, and the next step is to use the precise PPS signal from the GPS to improve the accuracy down to the microsecond level. Note: if you are working stand-alone, without any Internet servers, you may need an extra "flag1 1" in the fudge for the type 28 ref-clock. Please see the notes here for further information. Thanks to Whitham D. Reeve Anchorage, Alaska USA for the testing. But my time is 16 seconds out! If you have some Internet or LAN servers, ntp is clever enough to ignore the obvious "bad chimer", and may simply display a large offset for the GPS in the ntpq -p output when starting up. After a few minutes, the offset will revert to the correct value. The delay is not a problem in this case. If you have no other source than the GPS, then you should probably wait a few minutes before assuming that even the coarse seconds part of the time is correct. I haven't checked how long it will take NTP to step the clock by the 16 seconds needed after the GPS starts sending UTC rather than GPS time. If your GPS does this, consider adding some sort of battery backup so that the GPS-UTC offset is stored while the unit is down. Quite why I saw this issue while using gpsd is uncertain. Since writing the above I have been in contact with the author of gpsd who tells me that protection is incorporated into the gpsd software whereby it will not pass on the time to its shared memory until the output from the GPS receiver has a (GPST-UTC) value in excess of 10 seconds. So I should never have seen the 16 seconds faster value at all. Please note that this problem is likely peculiar to my particular GPS receiver - an evaluation board with no battery backup. Just be aware of this problem in case it bites you! It doesn't happen with the u-blox pure serial GPS receiver I describe later, as this board has battery backup. "Your mileage may vary", as they say! These come down as Zip files and, as I wasn't sure about downloading these from Google Docs directly on the Raspberry Pi, I downloaded them to a local Windows FTP server first, and then installed an FTP client on the Raspberry Pi to drag the Zip files across in FTP image mode - i.e. binary files. # FTP get 3.2.27-pps-g965b922-dirty.zip in binary (image) mode. (substitute your own commands here). In the pps/kernel-pps-gpio24 directory you will find a file kernel-pps-gpio24.img. This must be renamed and moved to the /boot/ directory, while we first take a safety copy of the original kernel image. /etc/modules using the nano editor to add the pps-gpio at the end. An aside - what is a module in Linux? "Linux modules are the same, although Linux modules almost always need to be compiled against the specific kernel version while Windows drivers are typically only bound to which release you're running. That is the reason you have to compile the kernel, rather than just plop down a driver downloaded from the internet. "That said, the reason your PPS driver is a module is that it makes it easier to tweak options. Almost all modules that are part of the main kernel source (which PPS is, for a year or so) can be compiled in rather than as a separate module, but you can pass options to a module as you load it while you cannot do that with a built-in. It also makes it possible to tweak the source, recompile just that module, and test it on the fly rather than recompiling the entire kernel and rebooting." To check that you are running the new kernel and that the pps-gpio module is loaded, then install the pps-tools and run it to see the changes on pin 24 (assuming you have a 3.3 V PPS signal connected. Warning: do not connect a 5 V signal to the GPIO pins! [ 0.000000] Linux version 3.2.27-pps-g965b922-dirty (root@bt) (gcc version 4. The "clear" entries showing as zero is correct for this driver implementation. Note that if you don't have a PPS signal connected to GPIO pin 24 the last three lines from the dmesg output may be missing. In the output above, the PPS source was only registered some 133 seconds after startup, possibly the length of time it took the GPS to lock. On a second system with no PPS connected the last three lines were missing. This test should still work even with NTP running and using the PPS signal. Unfortunately, the version of NTP supplied with the Raspberry Pi Linux does not support PPS. Likely it has been compiled to minimise its memory and disk footprint. These are the steps to download, compile and install NTP (with help from jbeal's posting). You can choose between a release and a development version as shown in step 4 below. You could also use a copy of the development tarball on your own local FTP server. So from logging in, here are the steps. The lines below are shown for development version ntp-dev-4.2.7p397, but you will need to alter the version number to suit the version you wish to compile. The two time-consuming steps (configure and make) appear to be CPU limited rather than SD-card I/O access limited. You can see which version I am currently running here. # first, and clear out the directory:  cd ~/ntp, rm -r ntp-dev-4.2.7p397, and start again from step 5. # or on the RPi with later versions of Linux with PPS and pps-tools installed. # It is required for the more recent Raspbian Jessie (later 2015). # This removes the original NTP and installs the new. # Step may not be needed - see below. # Recommend: omit this step. It is not entirely clear to me whether step 9 above is required. It does not appear to be when updating from 4.2.7p304 to 4.2.7p321, for example. I am not using step 9. Once you have a new set of NTP binaries, you first need to stop NTP, use super-user mode to copy the binaries to their final directory, and then restart NTP. Once restarted, a simple check that it's working correctly. I recommend these steps, although there are alternatives. See the note below about step 2.
so you may need to check both directories to get the most recent files. Check with "ls -l" which shows the file date. A confession: I did alter one system to point the NTP start-up to the directory I preferred, rather than leaving it pointing to an old version. I suspect that in my own personal use, only the ntpd and ntpq executables matter. If, like me, you have multiple Raspberry Pi cards, you will not want to waste almost an hour compiling and updating NTP on each card. Fortunately, my experience so far using the development versions of NTP (4.2.7p...) suggests that simply copying the binaries from one Pi to another works as expected. This may be luck, or it may be because the OS differences between Linux/3.2.27+ and Linux/3.6.11+ are not that great. If you have access to an FTP server (I used a Windows PC running IIS) you may be able to use commands such as those below to save a compiled version from one Pi and load it onto another. You may need to use sudo apt-get install ftp if FTP is not already available. Step 5 is required once. Step 7 is required for each new version you save. Replace "368" in the steps below with the version number you have just compiled. You will need to enter the password for the user "pi", although this can be avoided (I am told) by using public key based authentication, if that fits with your security model. Once you have managed to copy your key	to the second machine (man ssh-copy-id) you need no password either. I'm afraid I don't know how to do that, though. To get NTP to use the PPS data which is now available to it, the timestamps of the transitions on the GPIO pin, we need to add another refclock (server) line to the ntp.conf file. The server we use is a type 22 server called the ATOM refclock, and we can give it a reference ID of "PPS". I also changed the reference ID of the serial data to "GPS". Note that with a type 22 clock you must have one other server marked as "prefer". Note: when using the ATOM (type 22) refclock, one of the other servers must be marked as prefer. This is because the type 22 clock only supplies the timing within the second, and another server is required to determine the current second. Thanks to the folks here for their help. With the replaced version of NTP we lose the automatic running of ntpd at startup which was present in the original install. We also need to start gpsd so that the coarse time is available to NTP. This seems to work as expected, and allows the gpsd to automatically start up. To check that, I rebooted, and logged in, and could run cgps -s right away. However, NTP won't see the time from the GPS until after cgps -s is run. This is fixed as follows (thanks to A Carver): by default, gpsd won't connect to the GPS receiver until there is client software such as cgps with requires it. This allows for some power-saving in the GPS receiver. To circumvent this, the gpsd needs to be started with the "-n" option. These options are set in the directory /etc/default, so you need to edit the file /etc/default/gpsd to change the line: GPSD_OPTIONS="" to GPSD_OPTIONS="-n". Method A is to do this through dpkg-reconfigure gpsd, method B is to edit the file directly. NTP will auto-start after a reboot with either Method A or Method B above. There is a cut-out area in the ModMyPi case which will allow connections to the GPIO connector such as ribbon cable which you can easily break out and file down to a neat edge. The sharp-eyed amongst you will notice that three wires are shown - this is because the surplus header had three wires connected, but I only used two - ground (blue) and GPIO 24 (red). The black lead would be GPIO 23 but it is unused and not connected. There are two issues which are now becoming apparent with the particular GPS receiver I have and the Raspberry Pi. It seems that after a power-down reboot, the GPS receiver isn't correctly detected, and need a disconnect/reconnect of its USB connector before it is seen by gpsd. The pulse-per-second signal still comes through, though, so the precise seconds are working, but the coarse seconds are not. This is clearly unacceptable as you would not get the correct time unless you also had an Internet NTP server available. It is possible that a power-up followed by a reboot may resolve this problem. During the booting of the GPS receiver (if it does not have a battery) it may output GPS time (which is 16 seconds adrift from UTC at the time of writing). Although gpsd is supposed to catch this situation, it could mean that the Raspberry Pi will not know what the correct time is for some time after booting, and even then it could take 10-20 minutes to be sure that the correct time was actually being sent by the GPS and for NTP to make the 16 seconds step correction required. If your receiver has this 16-second ambiguity, be sure you have a source of coarse time available such as an Internet NTP server. Because of the problem (1) above, I bought a serial GPS receiver from China. By following the instructions here I was able to make the serial port available on the Raspberry Pi independent of its use as a login or boot-up terminal port. (Comment out the line like "2:23:respawn:/sbin/getty -L ttyAMA0 115200 vt100"
2:23 on my version of Linux, so be sure to look for the actual line with ttyAMA0. It was the last line of the file, as it happens). Note that the Raspberry Pi requires 3.3 V signals on the serial pins - not RS-232 level which will damage the device. You should now be able to configure gpsd to talk to ttyAMA0 (using sudo dpkg-reconfigure gpsd), and the cgps -s command should work as above. I found a 3.3 V I/O very compact GPS receiver board here described as: "GPS Receiver u-blox NEO-6M Module with Antenna USART TTL & IIC Interface". It includes the patch antenna and cost less than �20. Such modules seem to be a standard for flight control for model aircraft and similar applications. It does require one minor modification, which is to solder a wire to pin 3 of the NEO-6M module to extract the PPS signal. This unit was later replaced by a Adafruit Ultimate GPS Breakout which requires no additional soldering, and has a built-in antenna. second ground lead (blue) isn't connected either. +5V/0, orange the GPS Tx, and yellow the PPS. One the left is the receiver undergoing initial tests. You can see the patch antenna on the left raised on a block of foam so that it can "see" past the clutter of the receiver, the receiver itself on the blue PCB mounted vertically in the breadboard, and you might just see the orange-pink wire at the top-right corner of the receiver which has been carefully soldered to pin 3 of the NEO-6M to get the PPS signal. The wire is anchored in the top-right mounting hole for strain relief. You don't need surface-mount tools to make this connection, but you do need a very fine soldering tip and considerable care! Like the TX/RX signals from this module, the PPS signal is at 3.3 V level and therefore ideal for feeding the Raspberry Pi. The board will accept either 3.3 V or 5 V power while retaining 3.3V I/O levels, and I'm using 5 V to power the board to reduce the load on the 3.3 V regulator on the Raspberry Pi board. The U-blox device is specified at less than 50 mA supply current. For the final installation, the Adafruit module was used as its single package was more convenient. Not all the leads are connected as there is only one place to connect ground on the module (so the blue is left open), and for simplicity the green Pi Tx => GPS Rx was not connected. Judge the size of the Raspberry Pi by the Ethernet connector on the left! I found that the speed was already set to 9600 on a recent Raspberry Pi installed from the NOOBS software. I gather that on a typical Linux system you might use the command: stty -F /dev/ttyAMA0 9600. I actually didn't connect the TXD lead to the GPS module in the first instance, as the GPS receiver powers up sending data in the correct format, so there is nothing which the computer needs to control. There is a description of the GPIO pin header here. Again, please note that 3.3 V signals are required, not the 5 V level, and definitely not the RS-232 level! This configuration has been running since Friday, November 09, 2012. On reflection, I am unsure why I chose to make the stratum 15 in the example above, Possible stratum 2 or 3 might be better, otherwise NTP may think that the source is of very poor quality and fail to sync to it. Robin Scwab notes that you could try using the value of "Time offset" displayed in cgps -s as the starting value for the time1 parameter. This sounds to be a gooo idea, except that on one system here I happened to check Time Offset was about 0.640 seconds, but the best value for time1 (i.e. the value resulting in the smallest average offset) was 0.130 seconds. Where did the extra 0.5 seconds come from? Someone asked: "How many NTP clients can it handle?" Well, I have not done any extensive testing on how many clients this NTP server can handle (as it will easily be enough for use on a LAN, and it's not fit for public use in its present security date). I did manage to locate one NTP stress-testing program here, but the maximum rate I could get it to produce on my PC was about 75 packets per second, and the Raspberry Pi can handle that rate with ease. With NTP client PCs polling at 64 second intervals (the fastest normally used), that's 4800 clients, so easily enough for a small organisation. If you were using this for a small organisation, I would recommend using two or three stratum-1 servers so that you are covered in the event of failure - perhaps mark one of the servers "prefer" on the client PCs to avoid NTP from "clock-hopping". If you have better stress-test data, as Kasper Pedersen did, please let me know and I can publish it here. These are brief notes only, on an alternative approach which does not require a modified kernel with PPS support in the OS, nor does it require a recompiled NTP, but which produces slightly less accurate timekeeping. It may, however, be quite good enough for most purposes. The program was developed by Folkert van Heusden, see: http://vanheusden.com/time/rpi_gpio_ntp/ and announced in the Time-Nuts mailing list. You have installed the current operating system and any updates. You have made any optional IP address or computer name changes. You have got NTP working, preferably connected to your country's pool servers. You have recompiled and installed NTP to get a full version (is a re-compile required?). You have the PPS signal from the GPS receiver connected to the GPIO, e.g. GPIO-8 (pin 24), or GPIO 18 for the no-soldering board. You have installed and configured the gpsd software and utilities, and made gpsd auto-start. You have a GPS device connected either via a serial or a USB connection. The cgps -s command produces a correct display. You have configured NTP to talk to the type 28.0 shared memory driver, and can see the GPSD output in ntpq -pn. i.e. if the reported offset is negative, you need to make time1 a positive value. Now you should see much smaller offsets for the GPSD server. It's not essential to do this, but it gives you confidence that things are working as expected, it may help NTP in the early startup, and it produces a less confusing ntpq display. Don't forget to remove the noselect when you have the best value for the offset, and set the flags to include preferred so that NTP knows it can use that source as a seconds provider! There must be at least one prefer for PPS to work. This now has the NTP daemon seeing the GPSD device, and the next step is to add in some PPS support. watch -n0.5 "ntpq -pn | grep '.GPSD. 2 1 1' | tee --append GPSD_Offset.txt"
Pay attention to the single and double quotes in that command. If you notice, the grep is looking for the exact line from the ntpq -p output that contains your GPSD refid. So if you named it something different, that would replace the .GPSD. in the command. Also, notice the "2 1 1", that is the stratum, t and when fields. The stratum is whatever you set it to in the ntp.conf; the t should always be a 1 and the when is going to capture the output only when the timer reaches 1 meaning that it just updated the value. There is no sense in capturing data every .5 seconds for data that doesn't change! So the easiest way to get the value to grep for is to manually run the ntpq -p and copy from your refid through the when fields and that's what will be grepped for. Let that run for a good while - probably not really needed - but that's the point of getting a good sample size. This will capture the output from the ntpq command filtering to just your SHM/GPSD. This will all be saved to a file GPSD_Offset.txt in the current directory - that's what the "tee --append GPSD_Offset.txt" does. You can tail -f that file if you want while the watch command is running to see what is going into that file. NOTE: If you need to restart the process because you changed some setting and want to start over, delete any existing GPSD_Offset.txt file first. This steps through every line of the GPSD_Offset.txt file and totals up all of the offset values. It will also count how many lines/values are there. Finally it just prints the information: Total, count and average. The average value is what you would put into the time1 value as noted above. Don't forget to change the noselect to prefer when you are in there to add the time1 value. DJT: This is somewhat beyond my Linux, so my thanks to Angelo for the scripts and the detailed explanation. Angelo can be contacted here. As of 2013-Jun-18, rpi_gpio_ntp-0.3 was the current version, but thanks to Thomas Erthner I know that version 1.5 is now available, so I've updated the lines below. However, I've only tested version 0.3, not version 1.5. For more details, please see Folkert's page. This places the resulting binary in /usr/local/bin/. You don't need this for current Raspbian versions. "Fork into the background" disabled because of debug mode. To make NTP read the PPS timings on the GPSD shared memory, we need to use this command to start the program, assuming the PPS signal is being sent to GPIO-8 (physical pin 24 - see here). Use pin 18 is you are using the no-soldering board. and you can then use an oscilloscope to compare the time of the PPS rising edge with the toggling line from GPIO pin 7 (connector pin 26). On my system, there was a variable delay of between 270 and 390 microseconds between PPS and program response. Replace '8' by the gpio pin you are using, e.g. 18 for the no-soldering board. Don't get confused: the MRTG plot above covers rather more than one day, whereas the plots below cover just under half a day. On the plot MRTG plot, you can see that the RPi was changed from kernel-mode PPS at 13:00 UTC and run for a short while with Internet servers alone, visible as the larger excursions on the plot above around 13:00). The jitter graph shows a drop in averaged jitter (green line) from just below 7 to just above 5 microseconds after 18:00, when the minpoll was changed from 3 to 4. The initial higher value of averaged jitter is the tail resulting from Internet-only sync. On another Raspberry Pi you can see the dramatic difference between NTP sync over the network and that achieved with the user-mode PPS software. In this case, network sync was to a local NTP stratum-1 server over a Wi-Fi connection, and the PPS sync was with a U-blox 5S module. User-mode PPS was started just after 11:00 UTC in the middle of the graphs below. RMS offset dropped from a rather variable 48-80 microseconds to around 2 microseconds, and jitter averaged over 6 hours dropped from around 80 microseconds to under 2.5 microseconds. To monitor NTP you can edit the ntp.conf file to turn on the generation of more detailed statistics data. Note that this data maybe a megabyte or more per day, so think about keeping only a few days worth, and only enabling statistics collection when needed as the number of writes to the SD card flash memory is limited. The detailed information can now be found here and I offer a program to plot the statistics data and produce offset and jitter graphs such as those above here. I may have been unfortunate in locating one Raspberry Pi with an Adafruit module in a position where it was not getting as good a view of the sky as others, or it may be that other devices connected to that RPi or software installed is an issue. I have been seeing transient poor time-keeping (loss of GPS PPS signal) at intermittent times. I did discover that disconnections a lead to a USB hub connected to that RPi seemed to improve things. "The GPS constellation repeats roughly once a day. It is not at all uncommon to have a �worst case� satellite geometry for a given antenna location. If you have one, it will repeat once a day and show up as a bump in the timing out of your GPS module...."
Although the GPS satellites repeat position in just less than 12 hours, there is also the rotation of the earth to take into account, so the position repeats at your location every 24 hours (well, ~23 h 56 m). 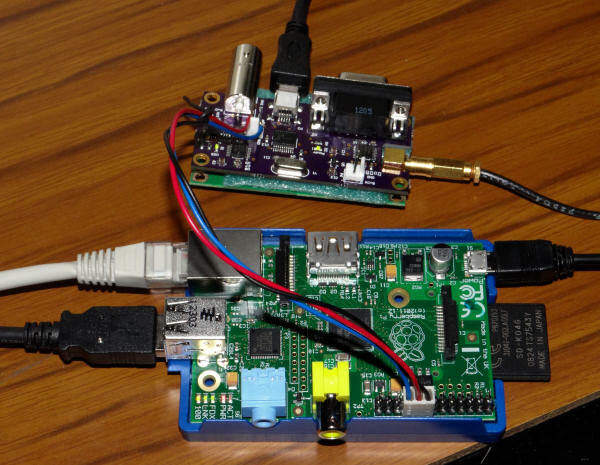 On reflection, 2014 February 09, this is the only Raspberry Pi with certain radio software installed, and the problem only seems to occur some days after a reboot, so I think I will stop recording the problem here. I am editing out the transients as they affect the P/N timekeeping graphs, but I leave the raw-graphs as-is. Look at the two final lines. leapsec shows the latest leap second (here is was on 2012 Jul 01), and when the leap-second file expires (here: 2014-Jun-01). There will also be a warning if the file is stale. Update the file from time-to-time - say every six months - in May and November as leap-second changes usually happen at the end of June or December. There is more information here. If you keep getting a different ntp.conf from that which you edited, your router may be the cause. It seems some routers give out NTP information in DHCP which the Pi by default uses over /etc/ntp.conf. You can produce real-time graphs like those below using MRTG and a simple script which can get the statistics from NTP remotely. There is more information here. I happen to run MRTG and the collection scripts on a Windows PC. The MRTG monitoring scripts (which I actually run on a Windows PC covering several Raspberry Pi cards) are in this Zip archive. My thanks to Webshed for uploading the information about using the DS18B20. GPS Devices used or considered - in alphabetical order! Receiving ADS-B signals on 1.09 GHz with a cheap TV dongle and feeding the results to Plane Plotter over a Wi-Fi link. This allows you to put the receiver right up close to the antenna, avoiding an expensive (or lossy) piece of cable, and avoiding the need for a cable run at all. Details are here. It's not much more than following someone else's instructions, but at least I can vouch for every command on that page, and perhaps you will find something useful there. A Digital Wall clock using the Raspberry Pi - synchronised with NTP, of course! More detailed information about rebuilding the Raspberry Pi kernel and some hardware based on my project may be found on Hauke Lampe's Web page. If you prefer a Fedora Remix variant of Linux, take a look at Adam Dosch's Dosch-man's blog entry. He uses the EM408 GPS module and his own PPS source. and to the folk in the comp.protocols.time.ntp Usenet newsgroup (or on Google) and time-nuts mailing list who were enormously helpful and patient with someone whose Linux knowledge is sparse!